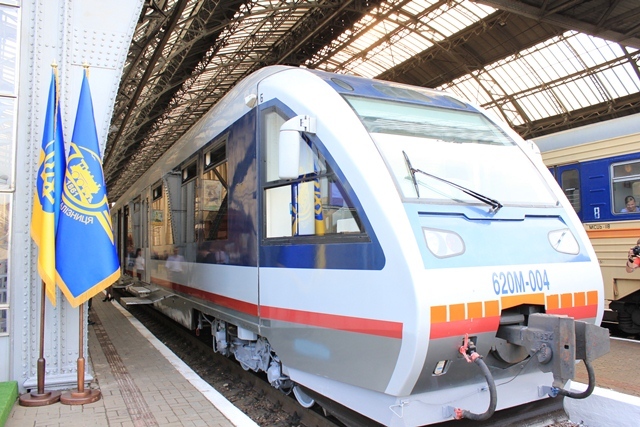 Its current formal name is The State Administration of Railway Transport of Ukraine, more commonly PJSC "Ukrzaliznytsia" (Public Joint Stock Company “Ukrainian Railways”) (coloquially known Ukrzaliznytsia, Ukrainian: Укрзалізниця, after its effective unification of its branches on December 1, 2015). The full incorporation of all the other companies should be by 2020. Some of the other companies (21 in total) in this public conglomerate are of a wide variety of ranges, from IT, to repair shops, concrete plants, logistics, etc. Donetsk Railways (abbreviated as DZ) Ukrainian: Донецька залізниця ), based in Donetsk. Odessa Railways ((abbreviated as OZ) (Ukrainian: Оде́ська залізни́ця), based in Odessa. Southern Railways ((abbreviated as PZ) (Ukrainian: Південна залізниця), based in Kharkiv. Southwestern Railways ((abbreviated as PZZ) (Ukrainian: Південно-Західна залізниця ), based in Kiev. Near-Dnipro Railways ((abbreviated as NDZ) (Ukrainian: Придніпровська залiзниця), based in Dnipropetrovsk. Lviv Railways (abbreviated as LZ) (Ukrainian: Львівська залізниця), based in Lviv The flag is a horizontal blue flag with the number 1861 and an old locomotive inside the wings, as part of the logo ) in yellow outline, as seen here: here. (source:) (the original source for the image is: here). Lviv Railways is a territorial branch company of Ukrainian Railways (Ukrzaliznytsia) headquartered in Lviv. It traces its roots back to the first railway line built in the current territory of Ukraine, (which) was the Przemyśl - Lviv line, which was part of the connection from Kraków. The line was constructed by k.k. priv. Galizische Carl Ludwig-Bahn which later became nationalised by the Imperial (Royal) Austrian State Railways It was built in 1861 under the initiative of Leon Sapieha, and was 98 kilometres long.